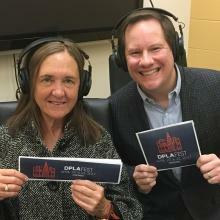 RAILS Executive Director Dee Brennan talks with Andrew Medlar, Assistant Chief, Technology, Content and Innovation at Chicago Public Library, about the Digital Public Library of America (DPLA) and DPLAfest, April 20-21, 2017, in Chicago. 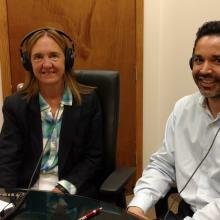 RAILS Executive Director Dee Brennan talks with Ryan Livergood, Executive Director of Warren-Newport Public Library, about how libraries can get started with fundraising, different strategies and events libraries can try, identifying donors and building relationships, the importance of establishing policies, and much more. 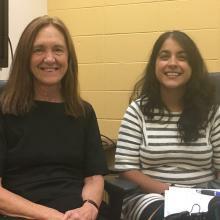 RAILS Executive Director Dee Brennan talks with Amita Lonial about how she got involved in the Libraries4BlackLives movement, the goals of the movement moving forward, and how libraries can get involved in efforts to foster racial equity and social justice. 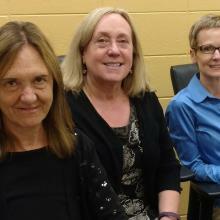 RAILS Executive Director Dee Brennan (left) talks with Sylvia Norton (center), Executive Director of the American Association of School Librarians, and Megan Cusick (right), Grassroots Specialist at the Office for Library Advocacy, about the Every Student Succeeds Act (ESSA). Topics include the status of the legislation in Illinois and why it is critical for library staff from all types of libraries to work together to support school libraries. RAILS Executive Director Dee Brennan talks with Miguel Figueroa, Director of the Center for the Future of Libraries (http://www.ala.org/transforminglibraries/future). 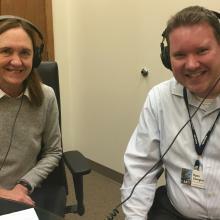 They discuss why the American Library Association started the center, how libraries can use its work to prepare for the future, and how to identify important trends.